On the attempt to always learn something new, I was playing around with Python, the Python-Twitter Package and the Schedule package. 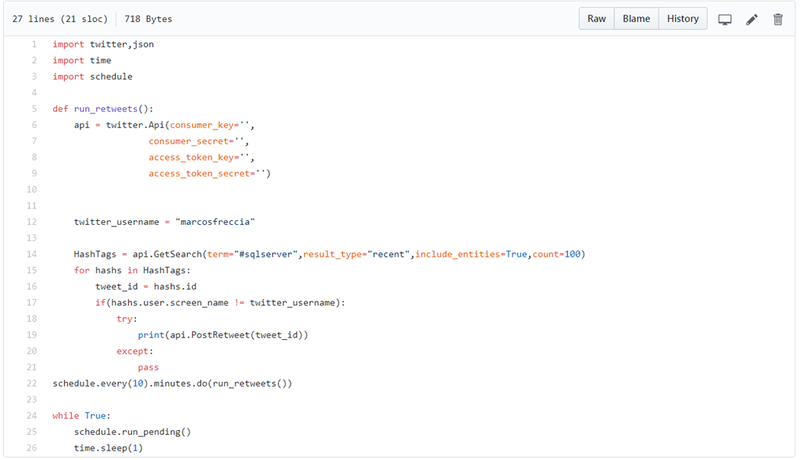 Pretty much I wanted to create a small script where I could every X minutes to connect on twitter and re-tweet some tweets that were using an specific hashtag. What do you need to get it running? 1) You will need a twitter account. In the script I just use my marcosfreccia twitter. The reason for that, well, it is off course to generate the keys and everything. 2) I am using Python 3.6. So, if you don’t have Python in your environment you can download this one. 3) You will need to install the python-twitter package. In this hyperlink you will find all the instructions for installing and creating the Twitter Tokens and Keys. Doing those four steps you will be able to have your own “twitter bot”. The script itself is still a bit rudimentary and needs some adjustments and improvements, but it is working! Posted on April 9, 2018, in VirtualPass and tagged Python, python script for twitter, python twitter client, re-tweet tweets python, twitter bot. Bookmark the permalink. Leave a comment.